In the distance somewhere, I hear the chimed of His grace, but the grief and pain within myself drowns it out. I am reminded of the comfortless comfort of the abyss and part of me tries to seek it. “Cling to Me, child.” It is His voice, firm, but no longer angry. He knows what is happening in me, He knew that I could handle no more than this. And this is why He insisted on waiting for this. My heart longs to cling to Him, but has not the strength, the grief and the old ways are so powerful. I struggle to obey though, managing to uncurl myself enough to look up at Him. It is enough! He meets me there, enfolding me in His arms, holding me as I weep. “I’m sorry Papa! I’m sorry. I will obey, I will do as you say.” I murmur over and over, crying into His strong shoulders. Finally the tears subside. He walks into the water with me. As I stand under the waterfall, my hood slips back past my ears. I hear the call of the abyss reach out to me. It resonates with my grief, drawing me there. But in the rush of the water I hear the chimes of grace as well. I try to focus on those and the effort transfixes me. I do not know how long I am there, but it feels sudden when He gently moves the hood back into place, covering my ears and shutting out the call of the abyss. I feel like I have been snapped back into reality suddenly. I am weak, disoriented as He leads me from the water. We begin to walk. Past the tree now, where the perfect rose, now crushed, lays covered in dirt. Tears trickle down my cheeks. I turn my face away know otherwise I will search for that artifact in the dust. My heart is wrenched as I do but somehow I think I have pleased Him. After we pass the tree, He stops and tenderly kisses my forehead, drying my tears with His thumbs as He gently takes my face in His hands. “I do not know how to do this Papa. I will obey You, but I don’t know how. Please, help me.” I whisper through more tears. “I will.” He promises. Then for a moment, He puts me in the loving arms of my husband to share with him something I never have, to allow him to touch a place I have allowed no one to go before, to acknowledge something I have always hidden before. And there is a joyous release in the doing. There was fear for me and some pain for him, but for both of us there was joy and anticipation in the new freedom. “Papa!” I cry, “Nothing else would have shown me this! No other way would be so clear. I never, never before would have allowed that boundary to be crossed. You did leave some of it private to me , but the rest you showed me how to share.” I am overwhelmed by it all. He stops us at the stone bench near the gate. On the right of the bench there is a small rose bush growing. He stoops to pluck a flower and hands it to me. 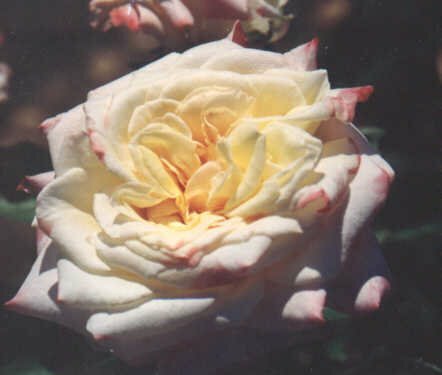 The small tea rose is deeply and wonderfully fragrant. The white petals are tipped with pink. A few have small bug-nibbles taken out of them. Another’s dry brown edge curls down daintily. The stem has a few tiny delicate thorns clinging to its side. The blossom is lovely and fragrant, but not perfect. I continue to stare at the tea rose. This is by far the hardest new expectation for me to expect. This kind of honesty is something new to me, I find it difficult to accept the idea that not only are flaws acceptable, but that it is safe for them to be visible to others. As we walk back to the grove, I share the distractions and trouble of my heart with Him, the pain I have in His service and confusion that threatens to overtake and overwhelm me. I do not know where I belong or how his promises will come to pass. I find my hands filled with icons of my confusion now, a key and an ID badge. I have worn them around my neck as symbols of my status and leadership. He takes them from me and nods. “You heart has been truly changed for you to give these to Me without being asked for them. I know what this has meant to you. This is a fragrant offering to Me.” The key and badge disappear into smoke in His hand and He inhales the fragrance deeply, smiling. “Although you do not feel it now, I do not take this offering lightly. It is a sacrifice to you and I know it. You have given Me the freedom to move and place you, a freedom you have always been afraid to give Me. I understand what this means to you.” He smiles on me, but my heart aches too much to receive it right now.